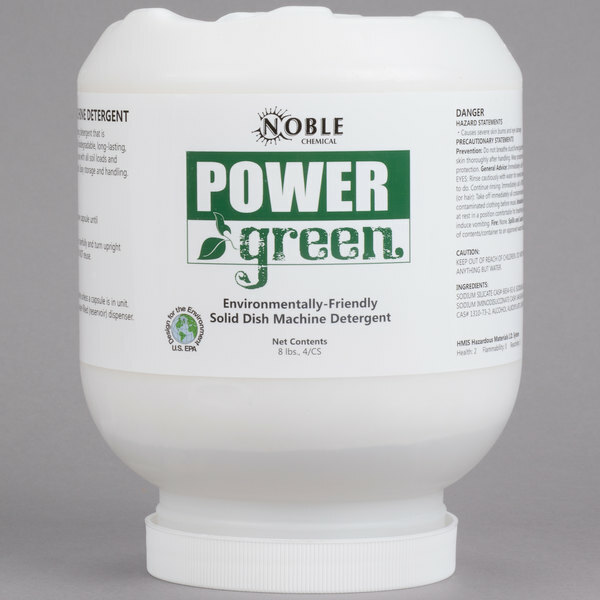 Specially formulated for heavy duty commercial dish washing applications, Noble Chemical's Power Green heavy duty solid machine dish detergent provides clean dishes and sparkling flatware, yet is phosphate free and readily biodegradable! Power Green is extremely safe to use, and complies with EU and DFE standards. This solid machine dish washing detergent can be used in any commercial dish machine that utilizes a solid form detergent dispenser, for all types of China, tableware and glassware. With this dish washing detergent, your sparkling clean dishes will impress even while you do your part for the environment!